Times Change. Talent Is Timeless. Reigning Champion Joe Holmes Wins From Predecessor Steve Brown. The dawn of a new era and what a dawn it turned out to be. Buckmore in February is normally bitterly cold but for this season’s opener the weather was unnaturally warm. A great start to the season. And it was back to the future with the Club returning to the three heats and finals format which made for some intense racing. Finally of course we had the new Rotax engines and no more pusher Karts so the traditional shout of ‘’we need pushers!’’ has been replaced by the blowing of a whistle. Perhaps we should start a new tradition on the lines of the Indy 500. How about ‘’drivers, start your engines’’ before the first heat of the day? Into the afternoon then for the Heavyweights who this year are spread over three classes. C1 and C2 plus the EssexFlatPack.co.uk sponsored Super Heavyweights. Steve Lindley on pole with Alex Pritchard alongside. Stephen Netting and Stephane Appleton on row two with long time Club 100 member Simon Lloyd sharing row three with Dmitry Zeldin. Lindley led the field away but lost out through the first hairpins dropping down to fifth. Netting got off to a flyer to lead at the end of the lap with Pritchard second from Lloyd and Appleton. Lindley was anxious to get back on terms with the leaders but unfortunately he made contact with Appleton spinning the latter out. Lindley would suffer exclusion post race. 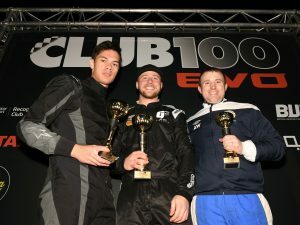 Netting continued to lead from Pritchard whilst 2018 Clubman’s Champion James Taylor had come into contention. Starting from grid eleven he was up to fourth by half distance and pressing Lloyd for third. With three to go he had made it by and was closing in on the leaders. Penultimate lap and Pritchard finally got by Netting for the lead taking Taylor with him into second. Final lap and things got a bit fraught through the hairpins with Taylor being forced off line. He lost momentum as did both Pritchard and Netting which allowed a following Lloyd through into the lead. And there he stayed, just holding off Pritchard on the line by 0.017. Taylor took third with Netting fourth and first C2 runner whilst Richard Appleton in twelfth was the first SHW runner. Fastest lap went to C2 runner Craig Brown. The new slim line SHW sponsor Stuart Germon drew pole for the second heat with Jack Bolton alongside. 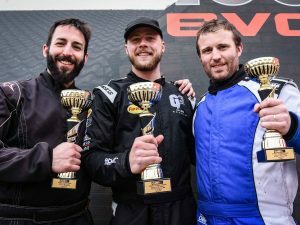 2018 Elite Champion Joe Holmes was on row two with Robert Stapleton alongside whilst Stuart Jones and Andrew Cherry shared row three. Germon led the field into the first hairpins but it was Holmes who emerged at the front as Bolton settled into third. Both Stapleton and Jones spun out leaving Daniel Taylor fourth, up from grid nine. Biggest mover though was Kevin Coombes rising up to sixth from grid thirteen. Holmes continued at the front still chased by Germon who had Bolton right on his tail. With three run Bolton made it by but could do nothing to catch Holmes who took the win almost one and a half seconds to the good. Germon remained third. A good drive this as he hung on to the leaders, both of whom were in the Elites last year. Coombes came home fourth having taken Taylor at one third distance with the latter claiming fifth. Konstantinos Kyritsis was the fastest of the C1 runners with Coombes fastest C2. Reigning SHW Champion Trevor Randall was quickest SHW. Pole for Steve Brown with SHW runner Paul Williams alongside. Row two, Pete Newbury and Matt Sussman with Chris Solomon and Ben Benneyworth on row three. Brown took full advantage of pole to lead whilst Williams slotted into second. Both Newbury and Sussman spun away their chances allowing Solomon into third. But a lap later he was down to ninth. With two laps run Brown was almost three seconds clear of second placed Williams who was defending for all he was worth. Whilst he might he have been slower than those behind he was giving a defensive master class much to the frustration of the following pack still headed by Hill with Lennie Wood just behind having driven through from grid fourteen. Half distance and Hill finally found a gap in Williams defence and was through into second. A lap later and Woods made it by too. But the race belonged to Brown who took the flag over nine seconds to the good from Hill with Woods third. Williams hung onto fourth and first SHW runner having had to defend mightily from a following Pennyworth and Adam Brown who was the fastest of the C2 runners. Brown was quickest overall with Benneyworth the quickest SHW. Richard Allen on pole from James Doherty followed by Keith Evans and Rob Adlam with Bill Taylor and Mark Turner completing the first three rows. Clean starts from both the front row sitters saw them lead across the line at the end of the first lap with Allen at the front. Evans and Taylor both spun out with Roy Grassie joining them in the boony’s whilst Turner slotted into third ahead of Adlam. Down the order 2017 Heavyweight Champion Adam Wright was moving up the order from grid fifteen. Eighth by the end of the first lap he was up to fifth by half distance and closing in on Adlam as Doherty slipped by Allen for the lead. And there he stayed holding the gap at a couple of tenths. But he almost let the win get away with a slow final lap which saw Allen just 0.094 adrift as they crossed the line. Wright took Turner for third on the penultimate lap and set the fastest lap of the race final time around with Mike Bodnar fifth but some distance behind Turner at the flag. Kyritsis on pole from Richard Newton with Jordan Salter and Coombes on row two and Wood alongside Jaeden Cadogan on row three. Newton was just a touch slow coming up to the line allowing poleman Kyritsis to put some air between himself and the chasing pack over the first few corners. Newton and Salter both got delayed whilst Coombes and Cadogan both spun down the order. Down the grid both Brown and Holmes were on a charge climbing from grids ten and twelve respectively, Brown to second and Holmes to fourth with Woods between them. Kyritsis was 1.7 clear as they crossed the line at the end of the lap. Holmes took a lap to find a way by Wood and close in on Brown for second. The front three ran well clear of fourth placed Wood who now had both Aaron Stevens and Lloyd closing in. Kyritsis continued to control the pace and crossed the line for the win one and a half seconds clear of Brown who was then docked a place for cone abuse promoting Holmes to second. Stevens got by Wood on the penultimate lap to head the C2 runners whilst an on form Lloyd made it by too after starting from grid fourteen. James Shield on pole from Peter Harris with Anwar Beroual-Smith alongside Steve Bosley on row two. 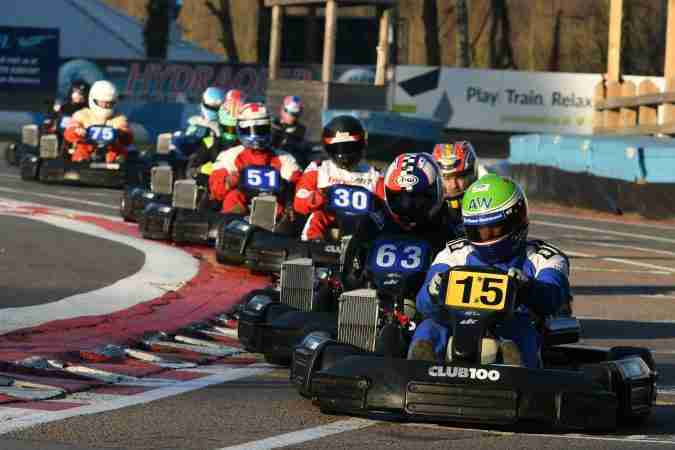 Great to see Anwar back in Kart. Paul Hibbeard and Adam Brown shared row three. Shield led away from the line but Harris was an early spinner along with Ben Robinson, Steven Downes and Steve Lindley. Shield led across the line at the end of the lap with Beroual-Smith half a second adrift in second ahead of Bosley. Beroual-Smith closed in rapidly on Shield and was ahead after three laps. 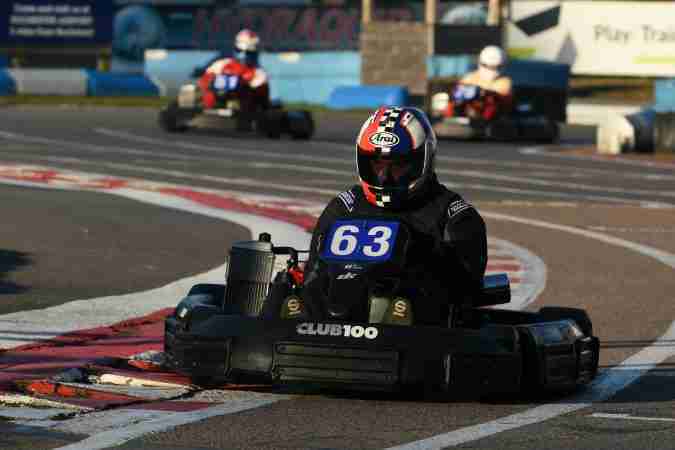 Thereafter he steadily eked out to take his first chequered flag for a couple of years. He was also the fastest C1 runner. Shield stayed safe in second whilst, Bosley Brown and Pritchard squabbled over third place. Brown finally got by Bosley with two to go taking Pritchard with him. Bosley fought back to fourth on the penultimate lap but had to settle for fourth behind Brown. Fastest lap of the race went to C2 runner Tarik Almou who started on grid seventeen and worked his way up to sixth at the flag. A great drive and a fastest lap that set a new class record. Pole for Anthony Brown with Dan Giles alongside. Jordan Salter and Andy Henley on row two with Mark Appleton and Adam Wright sharing row three. A messy start this with Brown and Giles both running wide at the first hairpin but managing to stay on track whilst Appleton and Vijay Patel both spun. All of which allowed Wright to jump into the lead with Salter second from Richard Allen who had moved up from grid ten. Also on the move was Stephen Netting, up from grid twelve to fourth by the end of lap two. At the front, Wright was in a class of his own increasing the gap bit by bit each lap and taking the flag almost eight seconds up on second placed Allen who had taken Salter early in the race. Behind these two was a great scrap for third, headed initially by Salter with Netting, Jones and Doherty close at hand. Salter held on well but it seemed only a matter of time and with three to go Netting made it by only to be taken by Doherty a lap later. And then on the final lap Jones too made it past Netting having taken Salter a lap earlier. Third to sixth were covered by a little over a second and several seconds clear of the chasing pack. Allen was fastest SHW with Netting the fastest C2 runner. James Taylor on pole with Harrison Darvill alongside. Row two shared by James Workman and Vinod Hirani with James Canham and Rob Moore on three. Taylor judged the start to perfection crossing the line two tenths clear of fellow front row sitter Darvill. By the end of the lap he was over a second clear of second placed Workman who did well to avoid the first hairpin clashes. Hirani and Canham both spun down the order whilst Darvill too lost valuable ground. Randal and Bolton both used their experience and racing nous to keep clear of trouble and were running third and fourth by the end of the lap having started on grids ten and twelve respectively. A lap later and they were second and third with Moore fourth from Darvill as Workman dropped down the order. Once into second Randal began to close in on Taylor whilst also keeping a wary eye on Bolton in third who was right on his bumper every time they crossed the start and finish line. But Taylor was keeping the gap constant and Randall began to fall way by a couple of tenths as he defended from Bolton. With Three to go Bolton made it by and began to close in on the leader. Moore too made it by Randall. 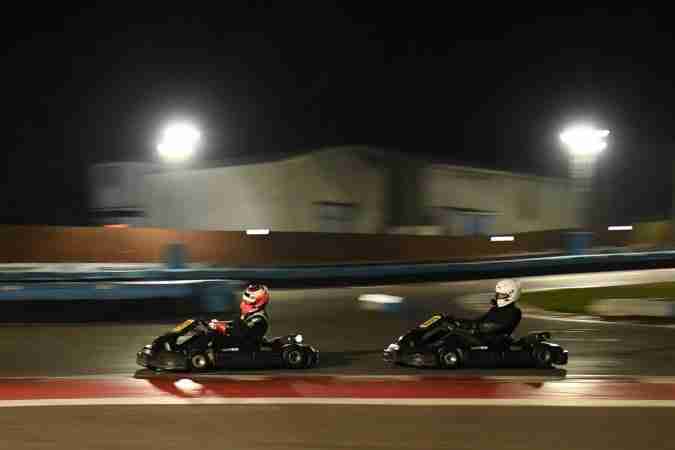 Taylor though had enough in hand to take the win with Bolton a Karts length back in second and Moore third over the line but penalised down to fourth for cone abuse promoting Darvill. Moore did have the satisfaction of fastest lap with Randall fastest SHW in fifth. Canham was quickest in the C2 class. Kieran Chidgzey on pole from Vijay Patel with Chris Sawyer and Roy Grassie on row two. Tim Hill and Aaron Stevens shared row three. Chidgzey led the pack away but Patel and Grassie were early spinners at the first hairpin allowing Sawyer into the lead from Hill with the poleman dropping to third. 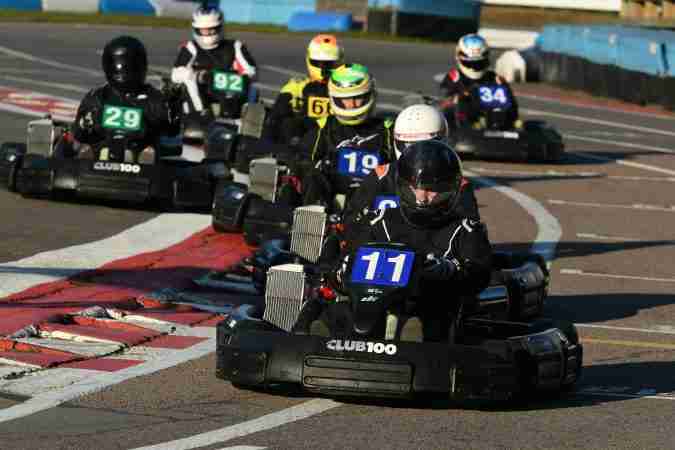 A lap later and he was down to tenth whilst Lloyd moved up to third from grid nine. Turner was into fourth from grid eight but all eyes were on fifth placed Allen who rocketed up from grid seventeen in the space of two laps. And running ninth was Kyritsis after starting on grid eighteen. 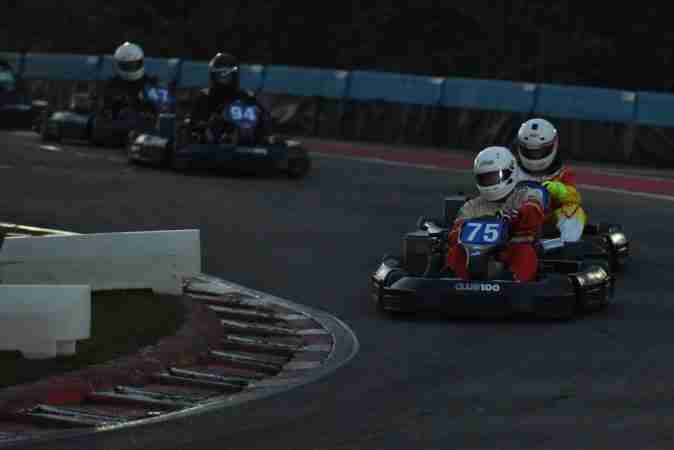 Hill took over at the front and immediately pulled out a gap of a few Kart lengths from Sawyer who in turn was running a few tenths clear of Lloyd whilst Allen was fourth a couple of seconds back. Turner remained fifth but Kyritsis was right on his bumper and soon up to fifth. Both sawyer and Lloyd closed up on Hill as he drove a slower penultimate lap but he quickly picked up the pace and the win whilst Lloyd took Sawyer for second on the final lap. Allen held on to fourth despite the close attentions of Kyritsis as they ran towards the flag. 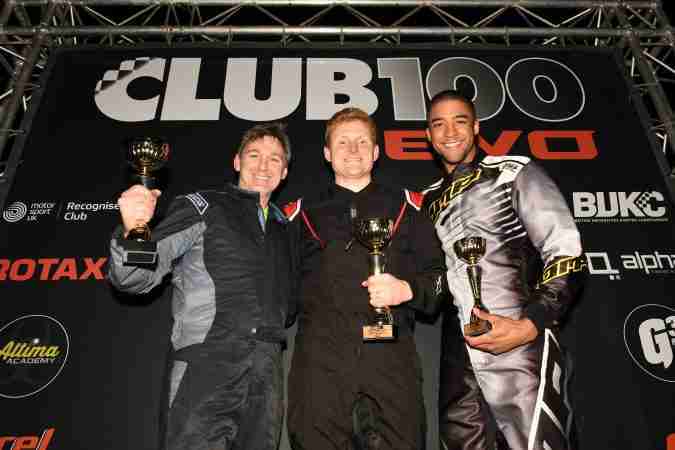 The latter did set the fastest lap of the race with Stevens the quickest C2 runner and Allen the fastest SHW. Mike Bodnar on pole from Helen Gander with Craig Brown and Tariq Almou on row two. Ben Robinson and Adam Wright shared row three. Bodnar made no mistakes as he led the field away but both Gander and Robinson were early spinners. End of the lap and Bodnar still led with Wright second from Jones, up from grid nine, and Brown up from grid seventeen. As one driver put it was like Moses parting the Red Sea as Brown came through. With three run he was into second and chasing down Wright for the lead, the latter having got by Bodnar on lap two. Wright soon succumbed to Brown but thereafter chased him all the way to the flag with Jones running third on his own but well clear of Bodnar. Brown took the flag just over half a second clear of Wright and set the fastest lap in the process. Jones crossed the line third only to be penalised for cone abuse dropping him to fourth behind Bodnar. Brown took fifth a couple of lengths clear of Beroual-Smith. Almou was again the quickest C2 runner with Paul Williams the first, and fastest SHW, in eighth. Pole for Philip Charman from SHW Trevor Randall with Steven Downes and Daren Townsley on row two. Blaze Sienko and Robert Purtak shared row three. Both Charman and Randall got a touch out of shape in the first hairpins whilst Sienko and Purtak both spun. Benneyworth, starting eighth, spun taking avoiding action. Biggest winner out of the first bends though was Rob Moore who moved into the lead having started on grid seven whilst Charman ran second from Downes and Randall. Townsley was fifth ahead of a quick starting Steve Bosley, up from grid eleven. Moore steadily drove away at the front as Charman and Downes fought over second. Randall fell away as first Bosley, Netting and Darvill all moved up. Moore was not going to be caught however and took the win by over three seconds. Second went to Downes, and first in the C2 class, who got by Charman with three to run. 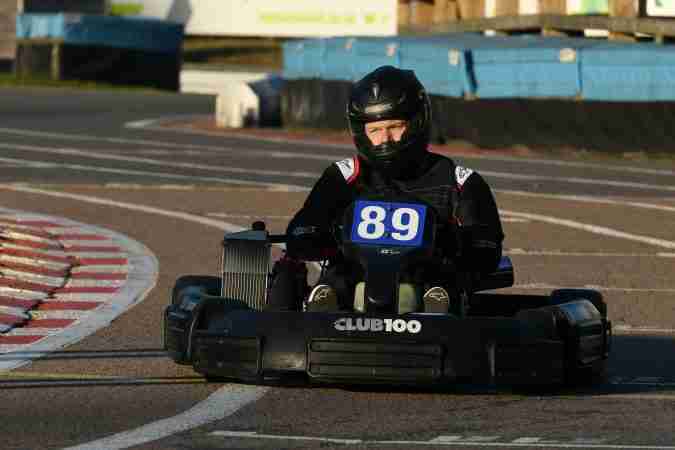 Darvill took third picking up places over the final laps and setting the fastest lap of the race. A good drive up from grid fifteen. Charman took fourth with Bosley fifth ahead of Randall who was the quickest of the SHW runners whilst Germon was the quickest C2 runner back in fifteenth spot. Daniel Taylor on pole for the final heat of the day with Nima Oparver alongside. Lee Carey and Kelly Rogers shared row two with Ben Cottle and Jaedan Cadogan on three. Taylor and Oparver led the pack away but Carey spun out of third and Rogers was badly delayed. Cottle moved into third but the big movers were Holmes, up from grid thirteen to fourth, Adlam, up from grid twelve to fifth and Pritchard, up from grid sixteen to sixth. Taylor continued to lead and Holmes wasted no time in getting by Oparver and Cottle to move into second. Adlam tried to follow him through but tagged Cottle forcing him to a halt. Adlam would eventually finish fifth on the road but suffered the inevitable exclusion. With three run Pritchard took over in third from Oparver but could make no impression on the leaders. Taylor drove excellently to maintain the gap back to Holmes although Holmes began to close late in the race. Taylor took the win by just over half a second and was the fastest C2 runner with Holmes the fastest man on track. The two of them were over six seconds clear of third placed Pritchard with Oparver fourth and Cherry fifth after Adlam’s exclusion. Lee Carey on pole from SHW Richard Newton with SHW Vinod Harani and SHW Kieran Chidgzey sharing row two. Row three saw another SHW runner Roy Grassie alongside Dan Giles. Row four, Jaeden Cadogan alongside Robert Stapleton with Paul Hibbeard and Mark Appleton completing the first five rows. Top four to move up to the B Final. A clean start for the first Final for the afternoon runners with Chidgzey making the better getaway and keeping clear of any trouble to lead by the end of the lap from Hirani, Carey and Newton. 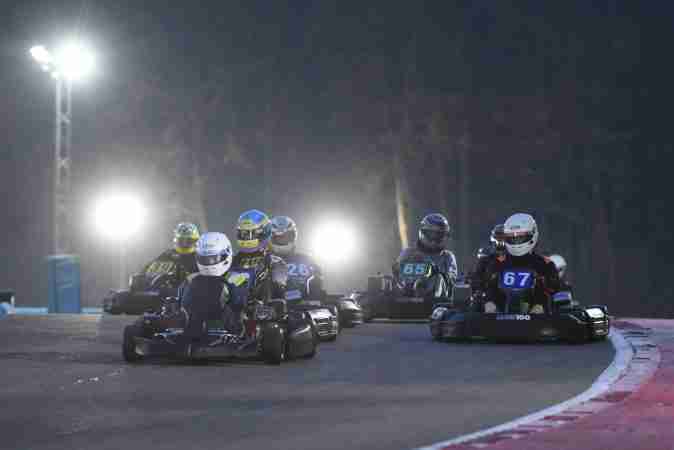 Thereafter he simply drove away from Hirani in second to take the win by over seven seconds and set the fastest lap. 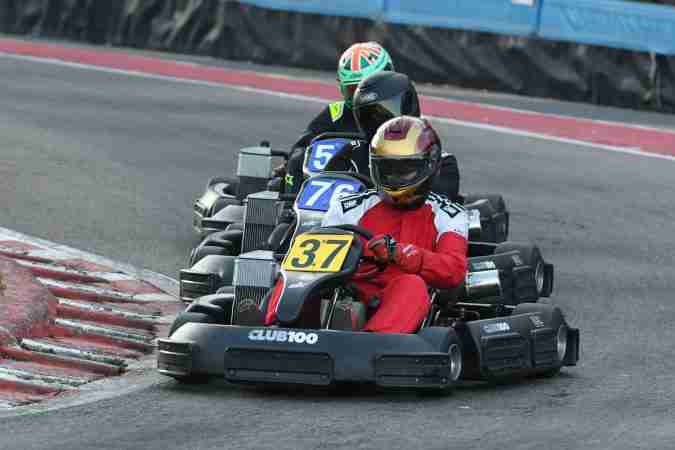 Hirani drove well too keeping himself clear of the battle for the third and fourth qualifying spots. Carey held third for lap after lap whilst Newton was holding off Sienko who had moved up from grid eleven to fifth at one third distance. The front five were by now well clear of sixth place held now by Adlam who had driven up from grid eighteen. Not without incident though as his chance of promotion was over even had he caught the leaders as he was hit by a four place deduction after forcing a driver wide. 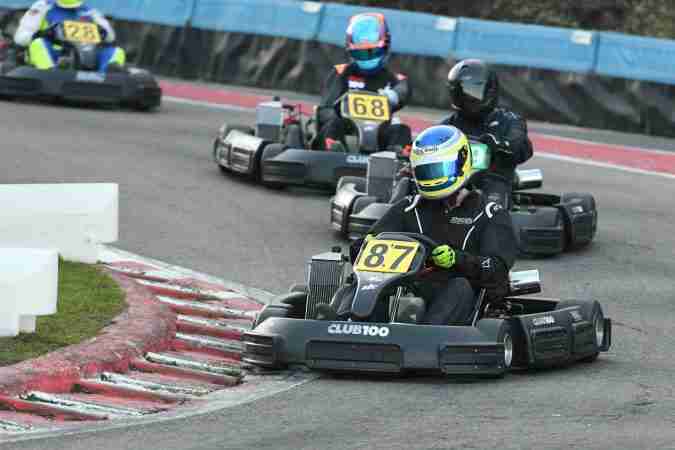 A shame as he clearly had the pace, setting the fastest lap in the C2 class. Two thirds distance and Sienko took Newton for fourth and homed in on Carey. Newton was still in touch and both off them slipped by Carey with two to go. Which was just as well for Sienko as he got hit with a one place deduction for cone abuse dropping him to fourth in the results behind Newton with Carey just a couple of Kart lengths adrift of Newton at the flag. Adlam would have been next some ten seconds clear of seventh but his penalty dropped him to tenth with Giles promoted to sixth from Stapleton, Lindley and Henley. These four were covered by just a few tenths at the flag. Aaron Stevens on pole from fellow C2 runner Kevin Coombs with Mike Bodnar and the first of the SHW runners Paul Williams alongside. Mark Turner and Ben Cottle shared row three with Harrison Darvill and Andrew Cherry on four and Tarik Almou and Chris Sawyer completing the first five rows. Just two to qualify for the A final. Stevens led the pack away but Coombes spun away his chances in the first hairpin. Bodnar went off in avoidance and had to wait till the last driver had gone by before resuming racing. Turner took full advantage of the confusion to lead from Stevens by the end of the lap with Williams third from the impressive Almou. Cherry ran fifth from Sawyer, Darvill and Benneyworth. Turner edged away from Stevens whilst Williams was again giving an impressive defensive display in third. 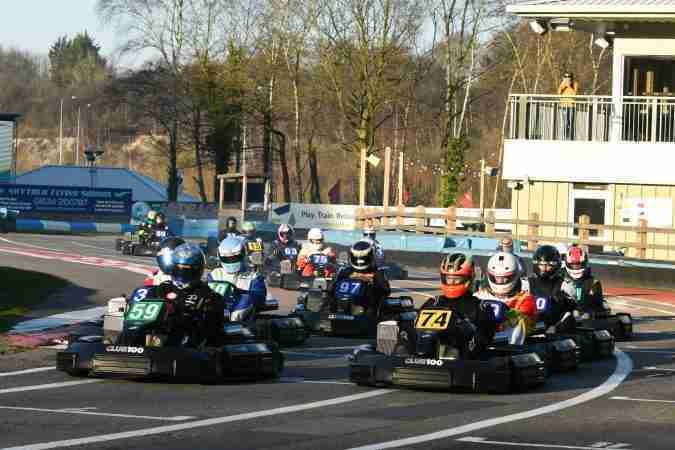 Cherry, Almou, Sawyer and Benneyworth were swopping places round the lap as each one had a go at Williams for third. Try as they up till half distance none of them could make a move stick. All of which allowed Turner and Stevens to disappear into the distance. By half distance Turner was nine and a half seconds clear of third placed Williams with Stevens almost eight seconds clear. Barring mistakes it was game over for the qualifying spots. Finally, Benneyworth found a gap and moved into third taking Darvill with him and dropping Williams to fifth leaving Cherry sixth from Almou. Closing in on them all was Germon. Having started on grid he’d dropped to fifteenth before fighting his way through the field. Impressive stuff from the SHW series sponsor now running in the HW division after his intense winter training programme. Turner and Stevens continued to circulate at the front whilst Benneyworth had his hands full holding off Darvill. With four to go Germon moved up to fifth but his move on Cherry was adjudged unfair and he would suffer a post race four place deduction. It could have been worse as Cherry kept running despite losing places. Over the final laps Stevens closed in on the leader and even made an attempt at the lead before thinking better of it and settling for second. 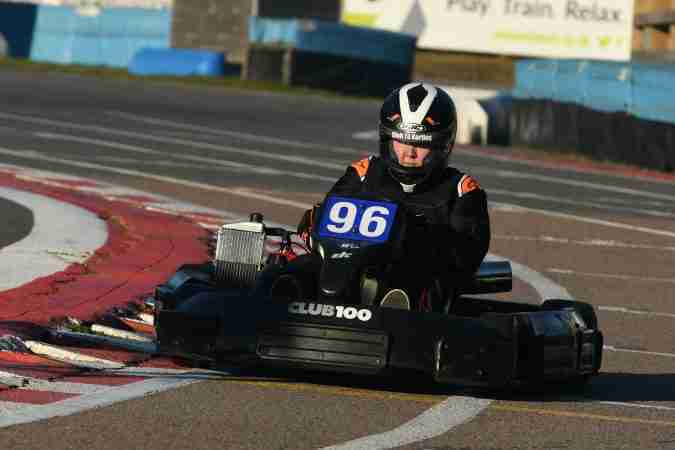 Turner took the win by a few tenths with Darvill third and first C1 runner with SHW Benneyworth a Kart lengths behind. Next would have been Germon but his penalty dropped him to ninth. A good drive though. His demise handed fifth to SHW Williams some five seconds back. He certainly knows how to defend. Fifth to eighth was covered by less than a second with Cottle sixth ahead of Almou and Harris whilst Purtak completed the top ten. Darvill set the fastest lap of the race with Stevens the quickest C2 runner and Benneyworth the fastest SHW. Steve Brown on pole from Joe Holmes with Adam Wright and Simon Lloyd on row two. Row three had the first SHW runner, the mightily impressive Richard Allen alongside current Champion Tim Hill. Row four, Alex Pritchard from James Taylor with Konstantinos Kyritsis and Anwar Beroual-Smith completing the first five rows. Six current or former Club 100 Sprint Champions in the top ten. As you would expect from such an experienced field no one tried to win the race at the first corner and as they crossed the line at the end of the lap Brown led from Holmes with Wright third from Lloyd and Allen. Hill dropped a place behind Pritchard with Taylor next from Beroual-Smith and Dan Taylor. With two run the order remained the same but down into the pit exit hairpin Doherty put a move on James Taylor who moved left to give him room and unfortunately impeded Hill. It was nothing more than a racing incident but it did drop Hill down to fifteenth. Half distance and Brown still led with Holmes just a tenth behind. Wright was on his own in third, two seconds adrift and a second clear of Lloyd in fourth who was just half a second up on fifth placed Allen. Beroual-Smith was sixth chased hard by Pritchard, Doherty, Rob Moore, up from grid sixteen and Jack Bolton. And so it remained for lap after lap. But with four to go Holmes began to mount a serious challenge. Having remained a tenth adrift for the majority of the race he cut the lead and began size up the leader through the hairpins. 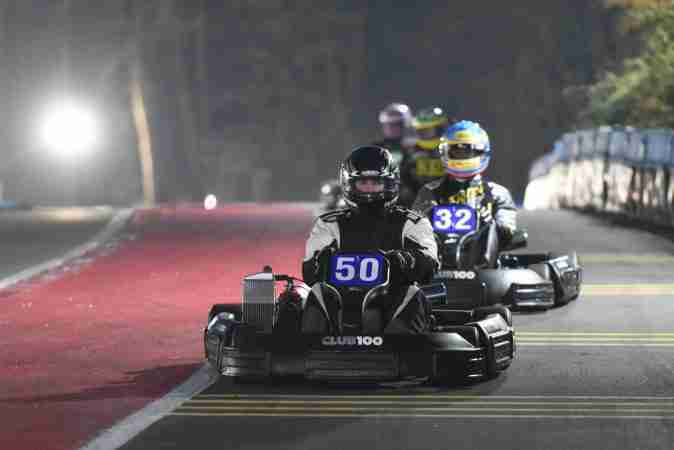 He executed the move to perfection pulling ahead as the two of them exited the second hairpin. But Brown wasn’t done and stayed right in Holmes wheel tracks. Over the line for the start of the last lap and Holmes defended into the first hairpin running wide on the exit but giving himself the inside but tighter line for hairpin two. As they came out the corner Brown tried to cut underneath the leader. He almost made it but Holmes had just enough momentum to remain alongside as they swept into the following left hand kink side by side. Into the flat out right hander at the top of the hill and Brown gave Holmes just enough room. Both kept their feet hard down. Holmes ran wide forcing Brown to the left. It was just momentum that took him wide, there was no malice. They swept down the hill with Holmes just inches in front but giving Brown room. Into the pit exit hairpin he was just ahead and defended superbly through the following bends to take the win by just 0.092. Fantastic and fair drives from both men. https://www.instagram.com/p/BuUM8AMFpRP/ Wright came home third just a second and a half adrift. A well deserved podium. Hopefully he can get a win this year. 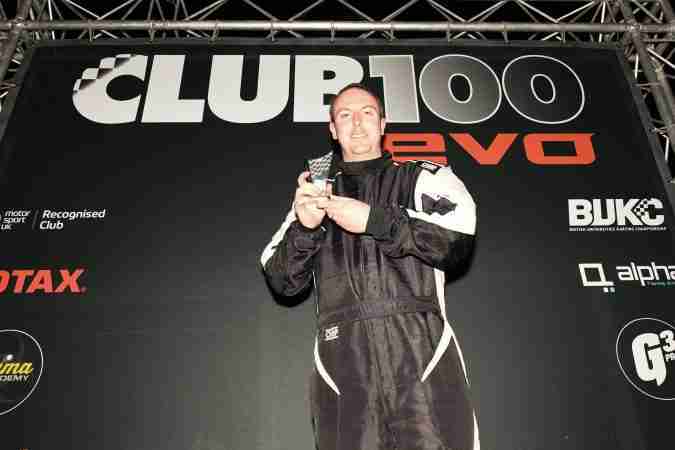 He remains the only driver in the history of Club 100 to win one of the major Championships without winning a race. Lloyd fourth place was his best result for some seasons and he too drove very well all day. 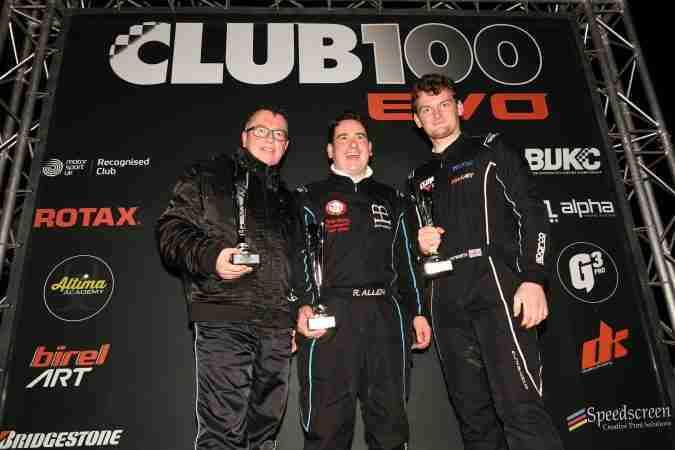 Richard Allen came home fifth on his Club 100 debut and took the EssexFlatPack.co.uk sponsored SHW honours. He also set the fastest time for an SHW runner establishing a record in the process. Second in class went to reigning Champion Trevor Randall back in twentieth place With Ben Benneyworth third courtesy of his fourth place finish in the B Final. Anwar Beroual-Smith took sixth place on his Club 100 return. A very, very, good effort. Lets home he can do some more rounds this season. Seventh went to James Doherty courtesy of a four place deduction for Rob Moore who dropped to eleventh. 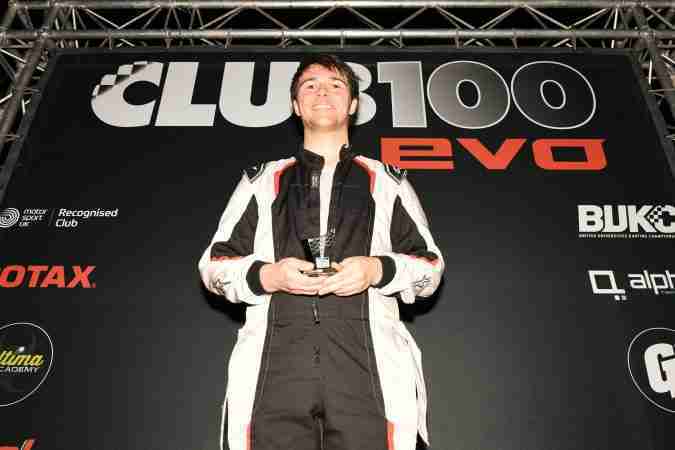 He did though set the fastest lap and left Buckmore as the C1 lap record holder. Bolton, Kyritsis and James Taylor completed the top ten. 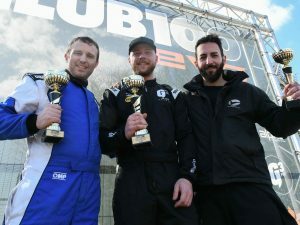 Dan Taylor took the C2 honours, and set fastest lap, with Steve Bosley and Aaron Stevens second and third. 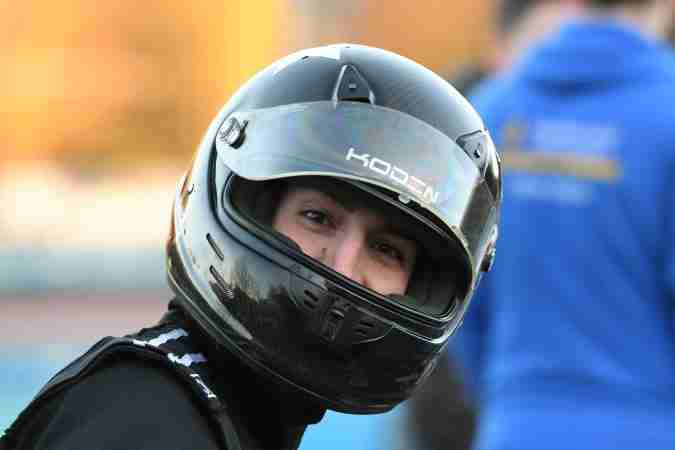 A great days racing with the new engines and format getting a big thumbs up. Our thanks of course to all the officials who do such a great job. It’s not easy. Shenington is next on the calendar. It’s going to be a great day. It would be great to see full grids again to go with the great weather that JV has on order.